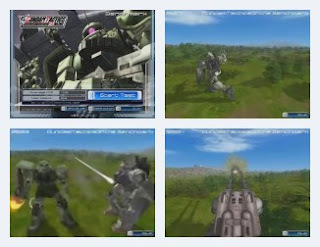 Gundam Tactics Online is another online game set in the Gundam universe. The benchmark shows Federation and Zeon units shooting and attacking each other in an open landscape. Short running time. Music and sound effects are nothing special. Camera awkward at times. Menu and options in English. Runs in a window only. Test score shown as framerate. A "2D" option available, which reduces the benchmark's visuals to a map and icons. Not recommended.